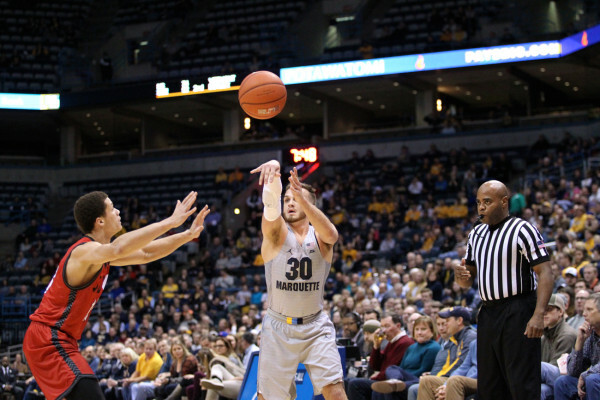 MILWAUKEE— The Marquette Golden Eagles' identity in the 2016-17 season has been their ability to knock down three-pointers and keep opposing defenses honest in the process. With a three-point percentage at 40.9 percent coming into Saturday’s game against regional rivals the DePaul Blue Demons (8-10, 1-4 Big East), the Golden Eagles (12-5, 3-2 Big East) drained their last nine triples, to go on a 32-9 run close the first half and on their way to a 83-58 win at the BMO Harris Bradley Center. Despite the success, things started out rough for the Golden Eagles as they missed seven of their first 10 looks long range attempts as the Blue Demons led for the majority of the first 10 minutes of the game. Things began to click for the second-highest three-point shooting team in the Big East as all 19 of Andrew Rowsey’s first-half points came in the final 8:46 for Marquette— highlighted by five long range makes, on the way to a season-high 24 points, on 9-of-10 from the field, to go along with 6-for-7 behind the arc. Rowsey emphasized a team-first mentality after playing three minutes in the Seton Hall game and stuck to the process as things paid off. "I know my role and [Wojo] told me to look forward to playing more minutes," Rowsey said. "I was trying to get others involved and Katin and Duane were making shots too. It was a team effort." Marquette shot 13-of-27 (48 percent) from three-point range and coach Steve Wojciechowski echoed the unselfish sentiment from Rowsey. "One of the things we talk about on a daily basis is on every possession, that we want the best shot," Wojciechowski said. "We have enough good players where that may mean one guy has a good game today and another guy in the next game. I think our guys bought into it today and hope it continues." Katin Reinhardt’s energy off the bench helped as his he finished with 19 points, on 3-of-5 from three-point range and forced DePaul’s defenders to rotate not only on him, but also Rowsey. "[Katin] found his footing and had his best game today. When he takes what the defense gives us, everything else clicks for us," Wojciechowski said. On the other end of the spectrum, Marquette’s defense gave DePaul’s leading scorer Eli Cain fits, as he was held to seven points, on 1-of-8 from the field. "Eli has made a really big jump from his freshman year to sophomore year," Wojciechowski said. "I thought we did a great job defensively to hold [DePaul] to 38 percent shooting. We were able to complete our defensive possessions better with rebounds today." The 119th meeting started on the right foot for DePaul, who has struggled to dictate the pace at the start of games for the most of the season as it scored seven of the game’s first 10 points. Tre’Darius McCallum showed no fear in finding any shot on the floor as he made a pair of three-pointers in the first 4:57. All of the other Blue Demon points in the first 8:50 came on looks in the paint by Joe Hanel and Levi Cook. As the first half progressed, both teams traded the lead four times over a 6:57 stretch, highlighted by eight straight points from Rowsey to give Marquette a 28-22 lead. While the Golden Eagles began to build their lead to 17 points off seven straight field goals, the Blue Demons sputtered on offense by going 7:42 without a basket. Marquette’s lead grew to as many as 24 points with four seconds left in the first half and would not look back as it led by double digits for the remainder of the game. Both teams return to action on Martin Luther King Day (Jan. 16) as part of the Big East Marathon as the Golden Eagles travel to Indianapolis to take on the No. 12 Butler Bulldogs at 11 a.m., while the Blue Demons head to Queens to meet the St. John’s Red Storm for a 3:30 p.m. tip. Both games can be seen on FS1.